– If you’re bored at work on Friday afternoons, give these guys a listen: http://sportsandrants.blogspot.com/p/show-segments.html. Two guys at St Josephs University do a sports talk show from Noon to 2 pm. They’ve got a site set up (linked above) with their past segments and interviews. I usually can’t stand the major Philly Sports talk radio (big surprise), so these guys might be a nice change of pace. Regardless, always nice to give the young’uns a chance. You can also follow them on Twitter @SportsAndRants. I’ve spent most of my time discussing the offense and defense. Today let’s start our analysis of Special Teams. The Eagles have made a number of roster moves this offseason that will change the composition of the STs unit. That might be a good thing. Last year the team ranked 25th overall by DVOA (Football Outsiders). Of course, if changing personnel can HELP the unit’s performance, it can also hurt, so we need to be careful with the assumptions we make. Unfortunately, the biggest single contributor, Alex Henery, is still on the team. MurderLeg might give him some competition, but Henery has to be the large favorite for the full-time job. Before we start analyzing the actual roster moves and the potential consequences, we should probably check the data to see if it even matters. In other words, is Special Teams performance largely skill or luck? If it’s luck, it doesn’t really matter what players you run out there (within reason). Of course, Eagles fans should actually hope it’s largely luck-driven, since that means an improvement is likely (given the poor previous performance). So what does the data say? That’s not what I was expecting. My ex-ante hypothesis was that STs performance does not persist with any significance. The data, however, give us a correlation value of 0.29, which is relatively strong. That means last year’s performance DOES give some indication of what we can expect next season, though it’s far from determinative. In the near future, I’ll pull this apart and look at the individual factors that comprise the FO data. That might shed some more light on what we can reasonably expect from the team this year. For example, last season the Eagles ranked 11th in “Hidden Points”, which are the factors outside their control (like opposing kickoff distance, opp. FG accuracy, etc…). Conversely, the team ranked just 18th in Weather Points, meaning they were harmed more than average by Weather effects, though since they play outside we may not be able to expect regression there. As you can see, there’s much more to do here. The overall takeaway, though, is important. 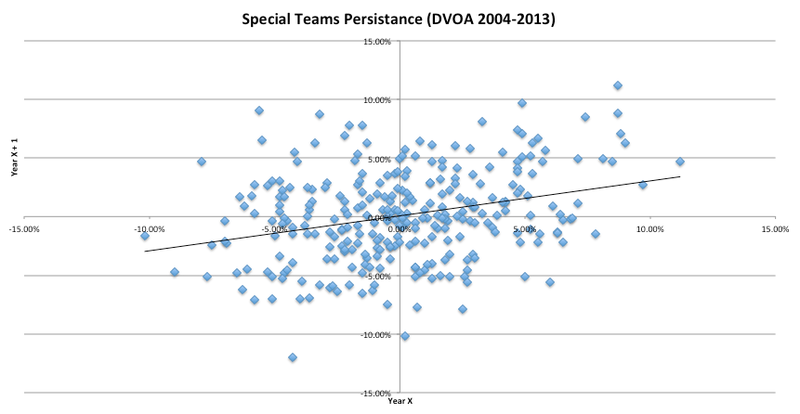 Special Teams performance, as measured by DVOA, DOES persist with relatively significant strength. That might mean we shouldn’t expect a great STs unit this year. OR, it might mean that significant roster turnover within the unit will provide a bigger boost than some of us expect. – Over the past 10 years, Chicago leads the league with an average STs DVOA of 5.07%. Cleveland is second with an average of 4.12%. In case you didn’t realize, STs have an effect on the outcome of the game, but not a large one. – Indianapolis has the worst average over the past 10 years, with a DVOA of -3.10%. Washington is next with an average of -2.57%. – The worst single season score within the entire sample belongs to the Washington Racists Football Team from last year. They registered a DVOA of -12.0%, which is remarkable. The best single season was by Chicago in 2007, with a score of 11.20%. That was the year Devin Hester had 6 kick/punt returns for a touchdown. However, the Bears still won just 7 games that season. Is there a statistical significance for ST DVOA and wins/losses? Seems you’re almost all the way to that conclusion already, just wondering if you or Football Outsiders calculated it. I’ll take a look at that soon. Not sure if its been done yet, but i have the data already, so won’t take long. It sure doesn’t look like special teams are all that important. There are four playoff teams in FO’s top 10 special teams units, including Seattle and SFO. But the Jags and Jets are at 9 and 10. Denver is 21. NOLA is 24 and the Eagles are 25. I’d rather Chip spent time and effort improving that secondary, or, alternately, not jettisoning talent at WR, instead of worrying about the not-hugely-important special teams. Sure its not so important when the kicker misses a FG and we lost the game by 3 or the kicker inability to kick a touchback resulting in a breakdown in KR coverage resulting in Cary Williams horsecollaring a guy to lose a game once again by 3. It may not mean much over the course of a season but in a big game scenario I would prefer to be blown out rather than get screwed by fails on a unimportant aspect of a football team. Are you and Cousin Wiley going to the Rockvale event brah?